Manufactured specifically for professional and industrial applications these batteries are among the most dependable long lasting alkaline power cells available. Value priced bulk quantities equate to substantial savings. Secure seal corrosion resistance protects valuable sensitive equipment. 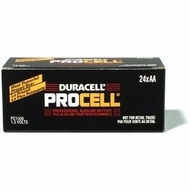 Please note - Duracell Procell is an industrial use battery that is used for one use type machinery.